Every week we'll be reviewing the worst gambling beats, upsets and wild finishes in the NFL. Here is the rundown for Week 13, highlighted by a lack of offense as defenses dominated early. Every week we'll be reviewing the worst gambling beats, upsets and wild finishes in the NFL. Here is the rundown for Week 13, highlighted by a lack of offense as UNDERs dominate early. ## Offenses struggle early Sunday was one of those sleepy days where offensive and defensive linemen were scoring rushing touchdowns. It wasn't a great day for fantasy owners, nor was it a great day for OVER bettors in the early slate of games. Of the nine early games, eight went UNDER. The only game that went OVER was the Bears/Giants, which had a total of 44.5. The teams combined for 57 points. Going back to Thursday night, the UNDER was 9-1 in Week 13 heading into Sunday's afternoon games. Only two teams - the Giants and Rams - reached 30 points in the early games. 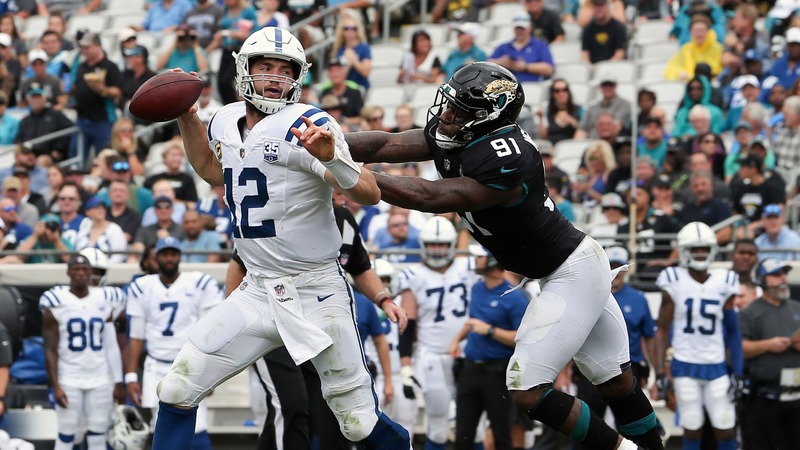 The Colts and Jaguars didn't even manage a touchdown with Jacksonville hanging on to win 6-0. Andrew Luck came in having thrown at least three touchdown passes in eight straight games. He had none. It was a tough day if you like offense. __More NFL:__ [Sunday night football prop bets ](https://www.betchicago.com/sunday-night-football-prop-bets-steelers-chargers) ## Gurley almost did it again Back in Week 8, Todd Gurley broke Twitter when he decided to stop short of the end zone with the Rams leading 29-27 over the Packers to instead let the clock run out. It impacted both the spread (Rams -7.5) and fantasy owners. We almost had a repeat on Sunday. The Rams were 10-point favorite over the Lions and led 23-13 late in the fourth quarter. The Lions kicked a field goal with 2:57 remaining to make it a one-possession game. Detroit was also covering the spread down 23-16. Rams bettors weren't dead yet though. Gurley broke free for an easy touchdown but...no, not again. Gurley stopped at the one-yard line instead of scoring for the second time this season. The only difference this time though is it was before the two-minute warning and the Lions had timeouts. Gurley should have scored. On the next play, Gurley calmed down all the Rams -10 bettors and fantasy owners when he plunged in from one-yard out to give Los Angeles a 30-16 lead. The roller coaster of emotions for gamblers continued though when Matthew Stafford drove the Lions down to the Rams' 14-yard line for a potential back door touchdown. However, Stafford was picked off in the end zone, securing the win for Rams bettors. ## Dolphins hang on late to cover The Dolphins were a 3.5-point favorite over the Bills Sunday and they needed every last second to cash for Miami bettors. The Bills took a 17-14 lead in the fourth quarter but Miami responded when Ryan Tannehill found Kenny Stills for a 4-yard touchdown pass. The score gave the Dolphins a 21-17 lead and cover with 8:42 remaining. It looked like it was going to be the Dolphins' day when Buffalo missed a field goal on their ensuing possession. However, after a Miami three-and-out, the Bills got the ball back with one last chance to win. Rookie QB Josh Allen led Buffalo down the field to the Dolphins' 30-yard line but faced a 4th-and-11. Allen was scrambling around and then fired a pass into the end zone to tight end Charles Clay, who was wide open. Just one problem. Allen was being pressured and couldn't get everything on the throw. The pass fell short of the end zone. Clay made a diving attempt to bring it in but he was unsuccessful. Dolphins bettors dodged a bullet. If Allen wasn't being pressured, that's a likely game-winning touchdown. ## Bears blow their chance Despite a miserable performance for 58:11 seconds (and some ugly magic even as they made their comeback), the Chicago Bears somehow found themselves in a position where they could have cashed in overtime after closing as 3.5-point favorites on the road. Unfortunately, they let the Giants march down the field on their opening drive before finally making a stand to hold them to a field goal and preserve their chance. The only problem is that the damage had been done. Even if the Bears had managed to score a touchdown to win on their possession, the extra-point would have been skipped and the final would have been 33-30. After such an incredible charge to salvage a chance despite the Giants having a 99.9 percent chance to win with less than two minutes, it was a huge disappointment for both general fans and Bears backers. ## Hot-seat head coaches buy themselves time with slew of outright upsets Seven of the nine coaches deemed most likely to be fired in a recent BetOnline.ag prop offering won on Sunday, seemingly saving their jobs for at least another week. Five of those coaches (Cardinals coach Steve Wilks, Bucs coach Dirk Koetter, Jags coach Doug Marrone, Giants coach Pat Shurmur and Ravens coach John Harbaugh) won as outright underdogs. And it has been a huge week for underdogs in general, beginning with the Cowboys upsetting the Saints outright on Thursday. That makes six outright upsets in Week 13 and underdogs are 8-6 against the spread. ## Steelers cough up 16-point lead as Chargers make it seven outright upsets With the Steelers closing as three-point favorites, the Chargers became the seventh team to score an outright upset with an extremely impressive road victory on Sunday Night Football. The Steelers staked themselves a 23-7 halftime lead and appeared to be cruising to a huge win in the AFC and the cover. However, Philip Rivers and the Chargers came storming back, winning in every phase of the game in the second half to pull off an incredible comeback. Rivers got thing started late in the third quarter with a touchdown pass to Keenan Allen, who would finish with 14 catches for 148 yards. Then, a two-point conversion from Antonio Gates made it 23-15. Early in the fourth quarter, a 73-yard punt return for a touchdown from Desmond King and two-point conversion would tie the game at 23. The Chargers would score again just a few minutes later to take the lead and then the Steelers would tie it on their next possession, which set the stage for a masterful drive from Rivers. The Chargers would march 64 yards in 11 plays, eating up all 4:10 seconds of game clock to set up a game-winning field goal where things got wild. The Chargers missed their first attempt but an offsides penalty gave them another chance that was then blocked. However, the Steelers were offsides again and set up another attempt from 29 yards that Mike Badgley would bang through despite yet another offsides. The Chargers win improved underdogs to 9-6 ATS so far in Week 13.